I need some cheering up today, and remembering I had this photo sitting around from a few weeks back does it for me. Daffodils: I know they're cheap but I still love them. 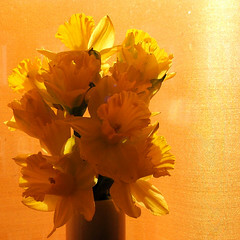 They always remind me of my mum, because it's her birthday on St. David's Day (March 1) when they are all around. Also, the song in the title, by Nina Simone - she (mum, not Nina) gave me a CD with it on, and now I can't find it anywhere. I really want to listen to it. Sob.